Haptics in a headset. That's as unrealistic as laser shooting urinals or stealthy lawn mowers. Or, so we thought. Razer is about to change everything we know about gaming headseats with their new Nari Ultimate. It has tactile feedback, and it will literally make you shake your head in disbelief. We've tried it - and we love it! Razer is back on the test bench. 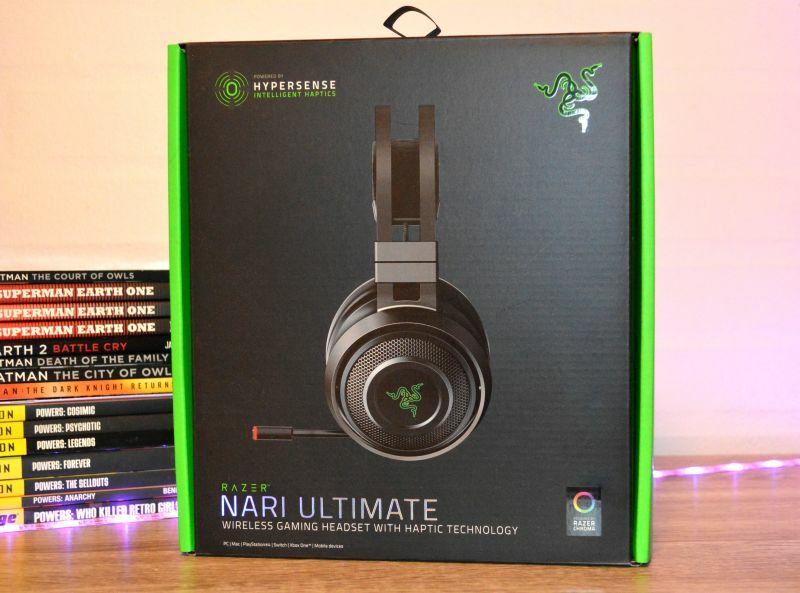 This time, we’ve received their innovative Nari Ultimate gaming headset that introduces Razer’s own HyperSense tactile feedback. Dwell on it for a moment. Haptic technology – in a headset! That, for one thing, has made me hyped-up about this review. 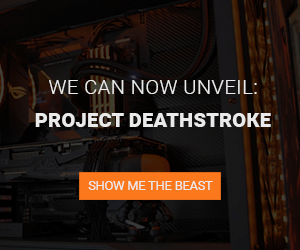 Other features include THX Spatial Audio, cooling gel-infused ear cushions, lag-free wireless connection, and adjustable game/chat balance. Razer is no spring chicken, and their packaging is pretty iconic with the asphalt background and the neon green that resembles the gooey slime all we 90’s kids indiscriminately played around with and put in our mouths. Let’s all hope it was free of chemicals. The front presents the headset, and the back shows all the features. That design is always a safe bet, and here, it presents the product in good fashion with a clear branding. 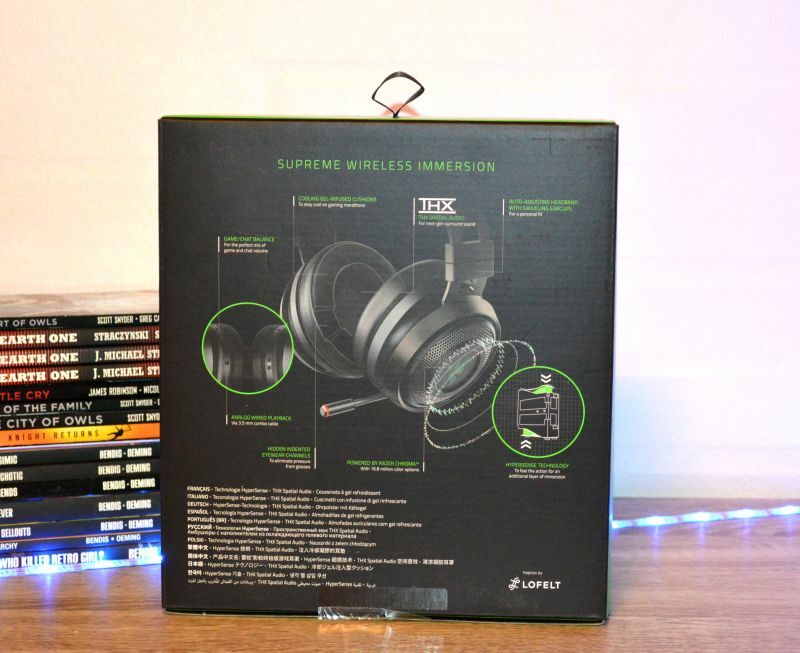 The box contains, besides the Razer Nari Ultimate headset, a 3.5mm jack cable for multi-compatibility and battery-free listening, a Micro-USB charging cable, a wireless transmitter, and the obligatory user instructions. Speaking of clear branding, this gaming headset leaves me in no doubt about its creator. Nari Ultimate is a Razer headset all the way. In terms of design, it closely resembles their Thresher series. It’s only bigger. Thresher is, by the way, an excellent headset that we were overly gratified with when we tried it out. 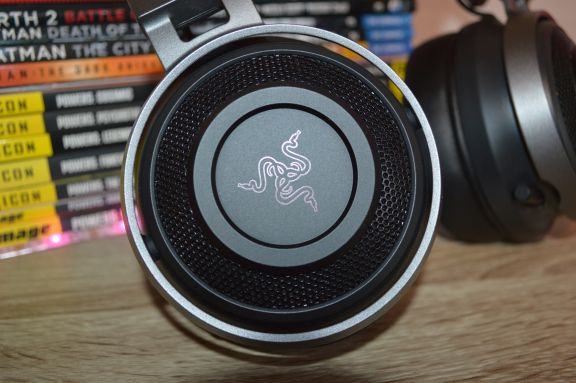 For the first time, Razer has paid much attention to the earcup size. The reason is the haptic feedback that is supposed to immerse you even fuller into the game, movie, or music. 50mm drivers deliver the sound, and internal batteries let you get rid of the wire. The headset weighs just below 16 ounces, making it significantly heftier than most gaming headsets I’ve ever tried. That puts weight on not only your head but also on the ergonomic requirements. I’ll come back to that later. Nari Ultimate is characterized by the classic Razer design, as mentioned earlier. 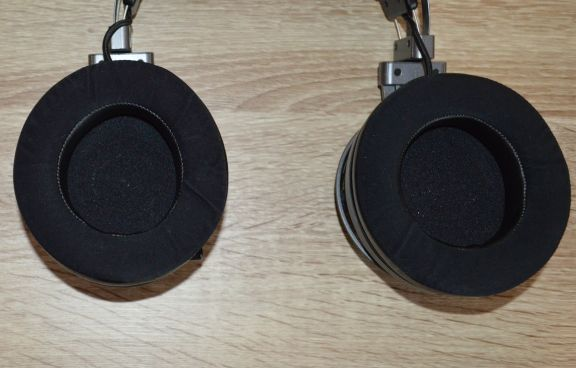 They have not only included the easily recognized elements from their Kraken and Thresher headphones, however. They have refined them. A thin black aluminum frame marks the headband. Despite its fragile appearance, the metal headband is both strong and durable and provides a firm grip. You also get a flexible inner headband padding that automatically adjusts to your head and distributes the pressure evenly without any uncomfortable pressure. 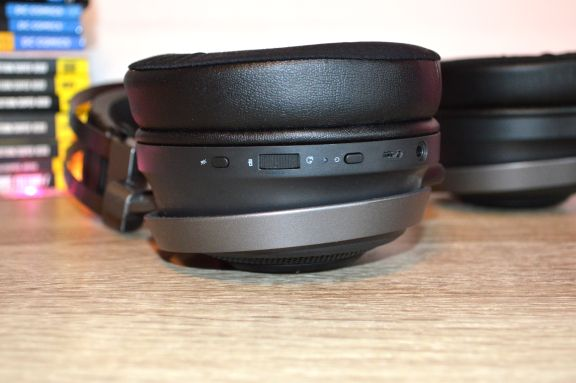 The two earcups are enormous – much huskier than what we have seen from Razer before. They can also turn 90 degrees for carrying the headset around your neck. The size increase is linked with the 50mm drivers and the haptic feedback technology. Let’s delve on what this actually does. You may know haptic feedback as force feedback or tactile feedback. It creates a sense of touch and motion by adding pressure, vibration, and movement to the device. You might know it best from your smartphone, as most newer models allow you to turn it on letting you feel when you press a button or key on the touch screen. The same happens in Nari Ultimate. The haptic HyperSense technology is tuned to give you a good rumble, especially with bass frequencies. According to Razer, this goes from 20-200Hz. On the left earcup, you find the expandable boom with a signal LED. In true classical Razer style, it is hidden inside the earcup when not in use. You also find power and mute controls, a Micro-USB plug for charging, and a wheel for adjusting the balance between in-game sound and chat. The right side features another wheel for adjusting total volume and storage room for the wireless transmitter. A bright and flashy Razer logo adorns both earcups, full of 2019-style Razer Chroma RGB-ganza – if you decide to activate it. You can also go back to the wires and plug in the old jack. The cushions are gigantic, and Razer has stuffed them with a cooling gel that alleviates both ears and skull from severe heat trauma. The headset has a great fit, and the padding rests well on the old pate. The self-adjusting headband works like a charm, and the Nari Ultimate unquestionably fits all the noggins out there, however gigantic or tiny. If you wear glasses, the cushions even contain small indents for your bows. To enhance sound and immersion, Razer has equipped the headset with THX Spatial Audio which creates a 360-degree soundscape around you. The haptic HyperSense further reinforces this. 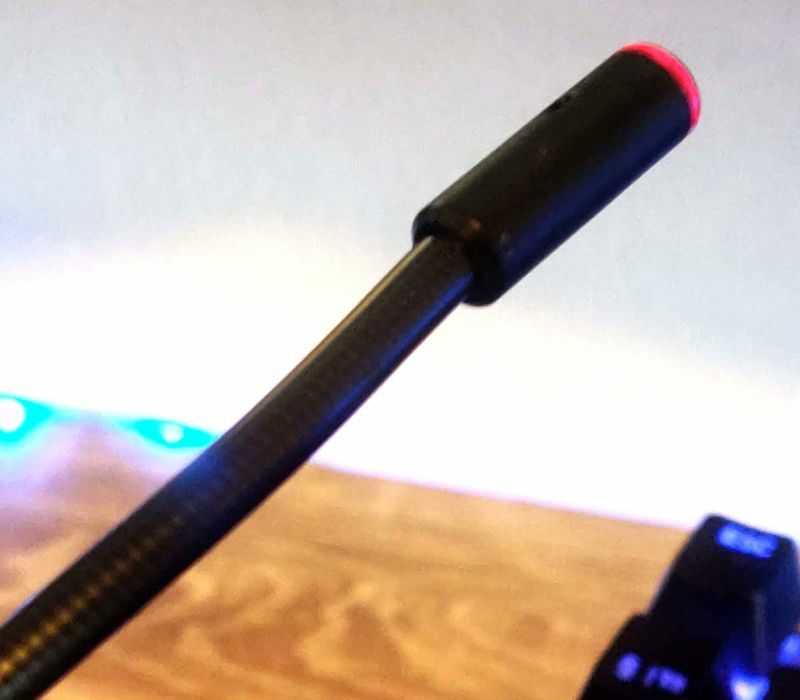 Developed by Lofelt, it works very well converting low-end frequencies to a dynamic, real-time tactile feedback. If it sounds crazy to you, it did the same to me wearing them. The vibrations feel truly natural, almost flowing from on ear to the other while following the sound seamlessly. This haptic technology felt electrifying, and it worked shockingly well in-game plunging me even deeper into the games. The configuration tool, Razer Synapse, is the same as every other Razer product. Here, you make all the tweaks and personalizations that turn this into a stylish, quality headset. Then again, you can also choose to go full retard and turn up every crank on RGB, bass, or HyperSense to eleven. Your choice. The configurations are easy to navigate, and you don’t need many clicks to adjust the settings. Besides sound, light, and motion, you also find THX and mic settings. When everything is set and done, and we have turned the RGB into an unholy unicorn fart, we are ready to join the action. For many of us nowadays, that means swearing at people’s mothers in another Battle Royale debacle in Fortnite, PUBG, or the new Apex Legends. The sound quality is as expected: A rich and detailed soundscape. I find the acoustics here fair and balanced under standard settings, even though I ended up nudging up the bass a little. It doesn’t bleed into the rest of the sound, but it keeps its presence noted. Mid-tones are clear, and the treble is as delicate as it should be. The reason for not letting the bass loose like a rodeo bull in a china shop is the HyperSense technology which augments those deep vibes with a whole new dimension. THX Spatial Audio is another technology that works well with haptic feedback. These two technologies go together like a horse and carriage, creating a perfect synergy. In short, the sound is sensational, and it feels even supernatural with HyperSense activated. One word of advice here: You can raze it all by going ballistic with both bass and HyperSense. The same goes for volume. Nevertheless, if adjusted correctly – and standard settings are a good starting point – HyperSense and THX Spatial Audio form a whole that is monumentally greater than the sum of its parts. Words do not describe it. You must try it for yourself. Hats off to Razor. They have created something truly unique. If we pull out the mic of the left earcup, we notice the classic flexible boom that you can place anywhere around your face, and that keeps its position. I find the boom a bit short, unfortunately. It couldn’t reach the optimal position in front of my mouth and had to live a reclusive existence on the side of my cheek. You can adjust the mic sensitivity in Synapse and activate talk-back if you want. Although it ended up passing the grade in my book, the mic tended to be a little too fond of the background noise, unfortunately. Razer has proclaimed the battery life of Nari Ultimate to be 20 hours without HyperSense and Chroma. If you choose to activate those two, you halve the life expectancy to a mere 10 hours. During my test, I could only hit the 8-9-hour mark with both technologies turned on and a volume set to a fair level for both movies, music, and gaming. Battery life is my main caveat regarding the Nari Ultimate headset. Maybe I’m just making a small plea to Razor to put in a larger battery. They have their reasons for the final design; thus, I don’t see the short battery life as a flaw per se. Nevertheless, I could’ve tolerated the increased weight and possibly size, seeing as the headset already is rather corpulent. Razer has prized Nari Ultimate at $199.99. In my eyes, this is cheap for such a revolutionary technology and design. You must consider that it is the first headset to feature sound-activated haptic feedback around your ears. 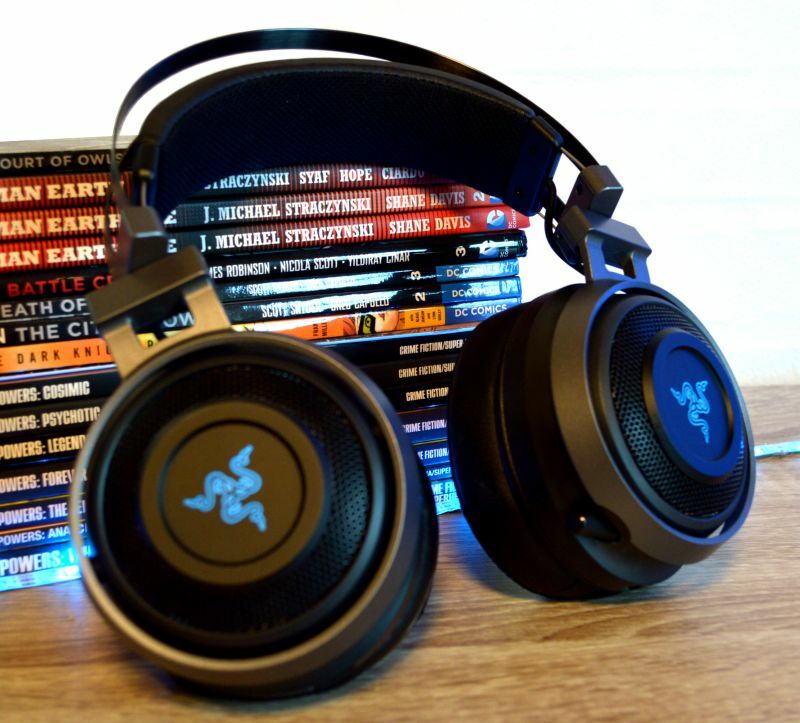 Nari Ultimate is a fitting name for this Razer headset. It is not the one with the best sound. It doesn’t feature the definitive mic. Battery life is not impressive by any means. 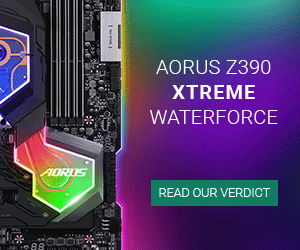 In spite of this, Razer Nari Ultimate is the ultimate headset anno Domini 2019. It all comes down to HyperSense technology. It lifts music, movies, and gaming to a whole new level. “Wow” is the only thought that comes to mind. Why has no one thought of this before? HyperSense makes so much sense, and everyone who argues against it will automatically lose any discussion. I’m a Nari proselyte; I can no longer go back to my old self and my old gaming headset. All hail the HyperSense! Furthermore, Razer has bestowed Nari Ultimate with THX Spatial Audio, making the sound a 360-degree experience in any combat game. Besides the clear in-game advantage, it also perfectly matches and augments the HyperSense haptic feedback. 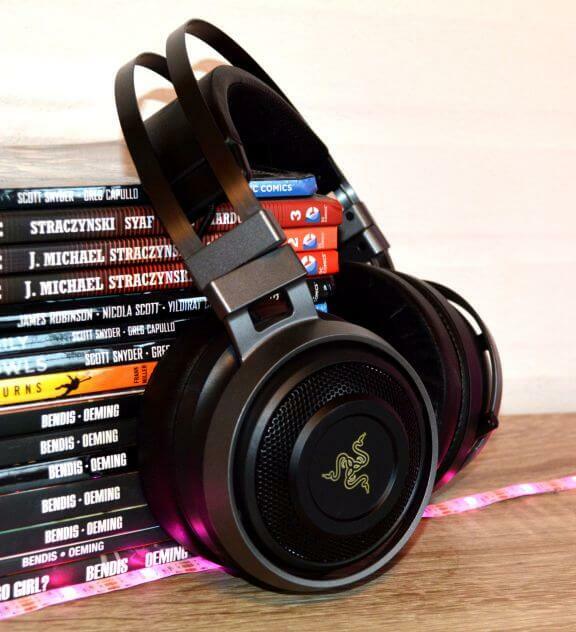 Nari Ultimate is not the best sounding headset in the Razer portfolio, but it does provide a good bass that creates a lively ensemble in cooperation with HyperSense. The mid-tones are adequate without being remarkable. Despite this, I strongly consider Nari Ultimate to be the absolute acme of modern gaming headsets. It transcends sounds. It is something more. Contrary to my expectations, the headset is strikingly comfortable. The weight is a little short of 16 ounces, but you don’t notice. The large cushions rest securely on your head without encapsulating you, and at no point did I feel overheated as is a typical issue with the over-ear design. The controls on the headset are easy to use on the go, and the Razor Synapse is equally user-friendly. 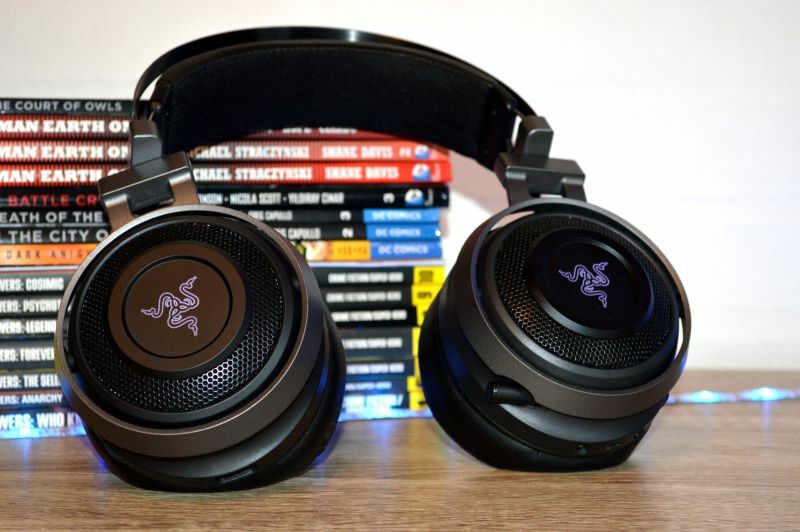 In my eyes, Razer Nari Ultimate is one of the most groundbreaking headsets we have seen the last couple of years. With Hypersense, it introduces an entirely novel idea in haptic feedback for a headset which creates a fantastic synergy when you use it for gaming. It is not a Hi-Fi headset, but nor does it try to be. We send off Nari Ultimate rocketing into the skies with a perfect 10/10 and a Great Product Reward. I’ll stop writing and get back to a soft ear massage, shooting some random strangers in my next Battle Royal venture.